Somehow or other, I had made it to the finals, and my good friend Cory was my opponent. 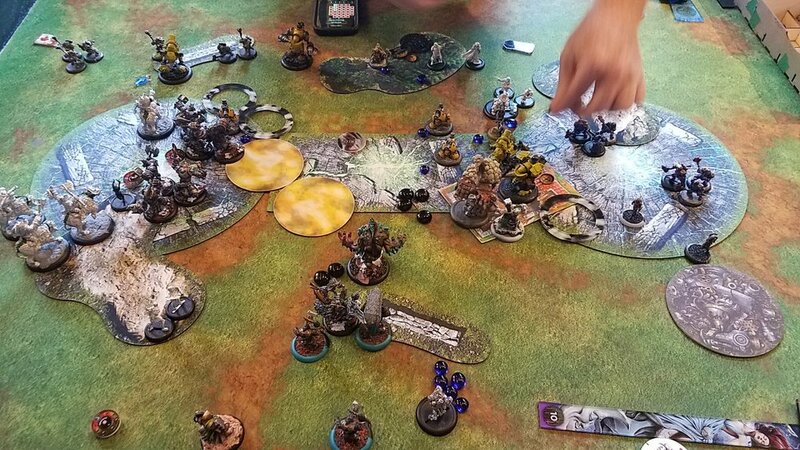 Cory and I have been dodging each other for about two years now, and I was legitimately worried about his Magnus 2 list. It has roughly sixty models in it, and he also brings Alexia and the Risen. With that in mind, I felt like I really had to drop my Kolgrima list to prevent him from recurring models over and over and over. Cory, on the other hand, felt that since we were playing Outlast, he couldn't afford to play Magnus, and so he dropped Ossrum. We were both a little surprised. Cory ADRed in Anastasia and a Spray Bunny, I ADRed in Lynus and Edrea to potentially abuse the clouds on the table, and I still won the roll off and happily chose to go first. 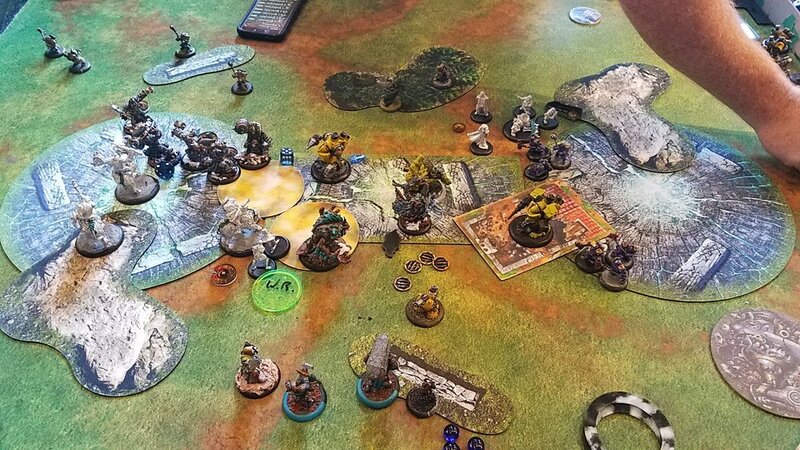 I didn't take a picture of this, but all of Cory's heavies have advanced moved thanks to the theme benefit, and under Ossrum's feat the Bashers threaten fifteen inches. I have to play around this a bit, but I opt to let him have threat range on one Long Rider on the left and one on the right. I put down a couple of clouds to hide behind, but getting Kell and Eiryss to both be out of range of my stuff is hard, and I've forgotten about Snipe so I think I'm safe from Kell aiming and getting double shots. The aforementioned Snipe goes down on Kell, which means he can aim and shoot twice. Eiryss finishes that Long Rider off, and then a Fire for Effected Artillery Corp kills another one. Cory commits absolutely nothing to any of the zones and just sits way back with his insane threat ranges. I'm stuck in a bit of a weird position here, and in hindsight I'm pretty unhappy with how I played this turn. First of all, I know Ossrum's feat is coming next turn and there's not a lot I can do about that. Furthermore, I need my Champs to be able to flex in either direction to go after heavies if they should come at me. Looking back, I should have built a nice little cloud bunker in the center zone and just put my Champs there so that they could easily get into either zone on the right or left with a Hunter's Mark to help their threat ranges. 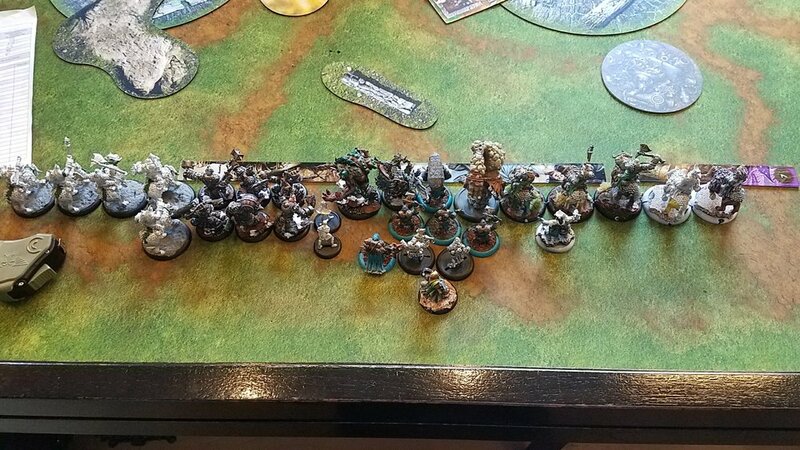 This would have let me actually reposition my remaining Long Riders into the center of the table with a similar idea, and Kolgrima could have used her Feat to prevent shooting for the next round while I jockeyed for position. Instead, I skewed really hard left and committed to that zone early. I really think this was a mistake in hindsight, and it's something that I need to remember for the future. Either completely commit to a skew or stay central and be able to strike wherever is best. I put the Earthborn touching both the right and central zones and I put a cloud wall in front of him. The three Long Riders in the now diminished unit went after Alten, Kell, and Eiryss. 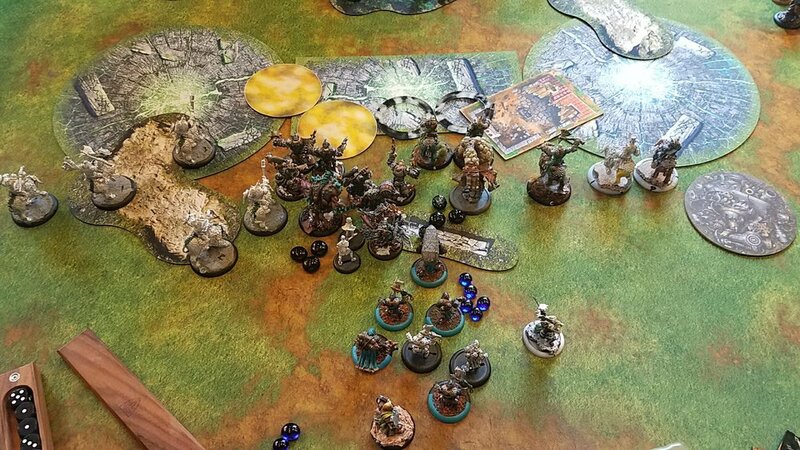 I missed the charge on Eiryss, but the other two died and I repositioned backwards. Everything else skewed left a bit and I called it a turn. Cory did a beautiful little maneuver here and bulldozed my central Long Rider next to my Earthborn so that his Driller could charge in under feat. His Eliminators on both sides ran up, and his Forge Guard continued to stay back behind the jack wall. He put a Basher toeing the left zone and a Blaster fully in the left zone to spray down some Champs. Hutchuk ambushed and Quaked a Long Rider and Anastasia finished it off. No one scored, but my Earthborn was on life support and I felt on my back foot. So I had a plan here. Slam the Basher out of the left zone, kill the Blaster with Champs, and kill the two Kayazy with Long Rider charges and several attempts at back arc swings from Champs. Unfortunately, dice were a little cold here, and the three charging Champs left the Blaster fairly alive. I also couldn't hit that Kayazy with anything, so the zone stayed well contested. Kolgrima popped her feat here to turn off shooting, and my Raged Earthborn pounded ineffectually at the Driller. I left it on about 8 boxes, so I charged the Fell Caller in to try and finish off the job, but he failed. Some big things I did not do well this turn. First of all, my Krielstone is just chilling in the back with zero reason to. If they just flood the middle zone, Cory is going to have a hard time clearing it. Secondly, I moved my Earthborn OUT of the right hand zone because I didn't want to get charged by Forge Guard. I should have just left him there, because he was a dead Troll no matter what I did and this way I at least don't go down scenario on my turn. Cory scores at the end of this turn and I do not. Cory trivially clears the middle zone and contests the left zone with a bunch of stuff. He also runs Kayazy to jam the Krielstone so they can't run and contest. Critically, he doesn't measure 18 inches from Kolgrima this turn, and he goes to no camp. I don't have a picture, but Cory scored two. 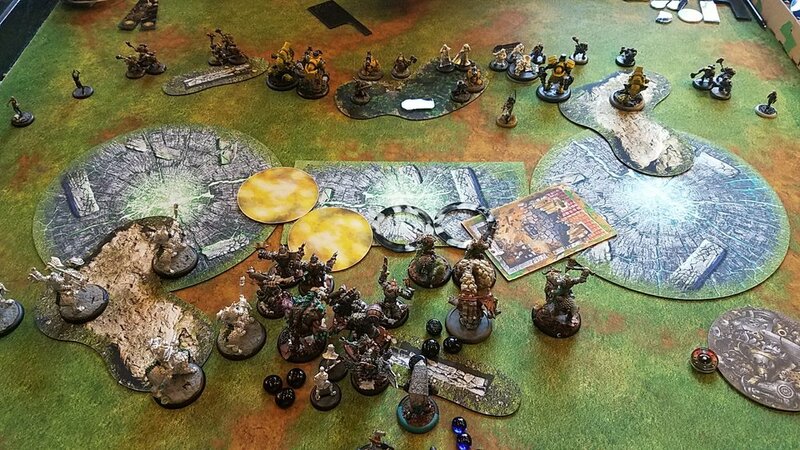 I do the math on Oddsmachine, and it's almost a 40% assassination on Ossrum with Kolgrima charging his Basher and spraying through it to hit Ossrum. I do five with the first spray, and then no damage with the second. I need an 11 and 12 for damage to kill him with two more sprays, so I opt to just camp and try and keep Kolgrima alive. I am able to clear out the left zone finally, but I can't get to the right zone to contest at all, so we both score this turn bringing it 1 - 4. 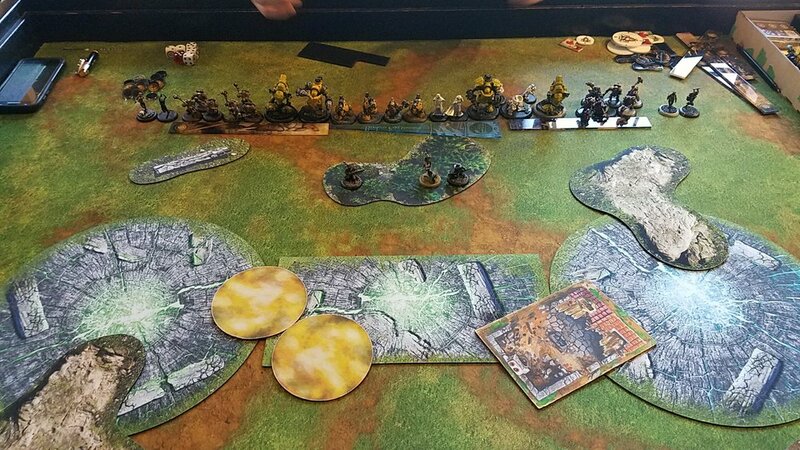 A Fire for Effected Mortar shot kills Lynus and Edrea, and a bulldozing Driller pushes my Mauler and Long Rider out of the zone. 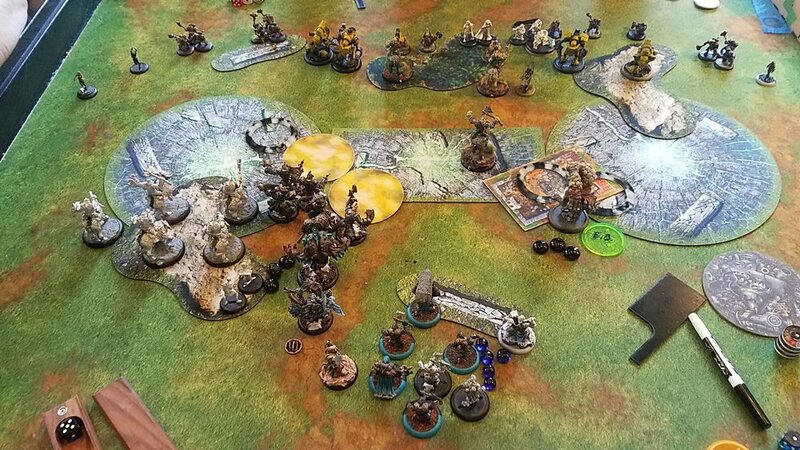 Cory runs and contests and scores two points to win the game. I was pretty happy with this game immediately after the event, but in hindsight I think I played this game pretty poorly. 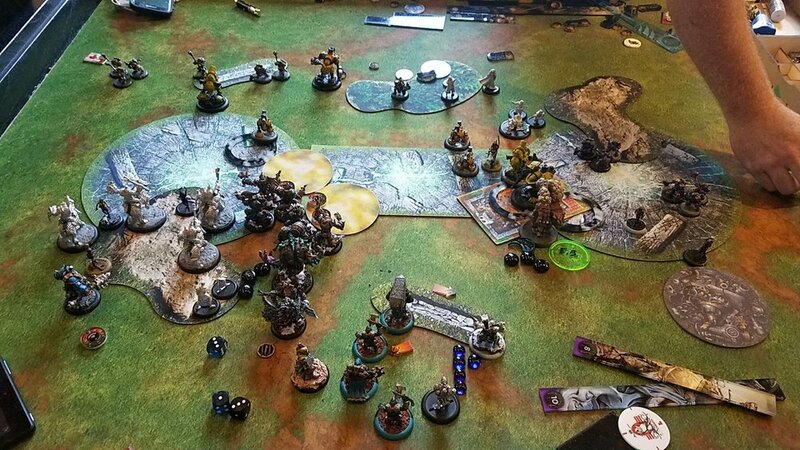 My positioning on turn two was questionable at best, and I think if I'd just shoved everything into the middle of the table and been able to hit both zones at once, it would have gone much better for me. Also, pulling the Earthborn out of the right hand zone was one of the biggest "whoops" moments I've had in recent memory - not good! Cory played a really solid game, he really had control the entire time, and was a fantastic opponent. We'd been joking at the hotel on the night before day 1 that we'd meet in the finals, and it was pretty great to actually do that. 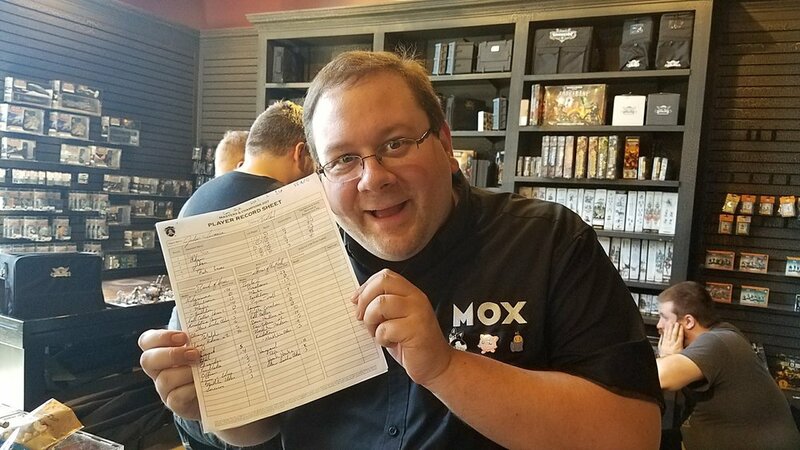 Here's my lists again, post event, (and a cameo of Jeff modeling my lists). 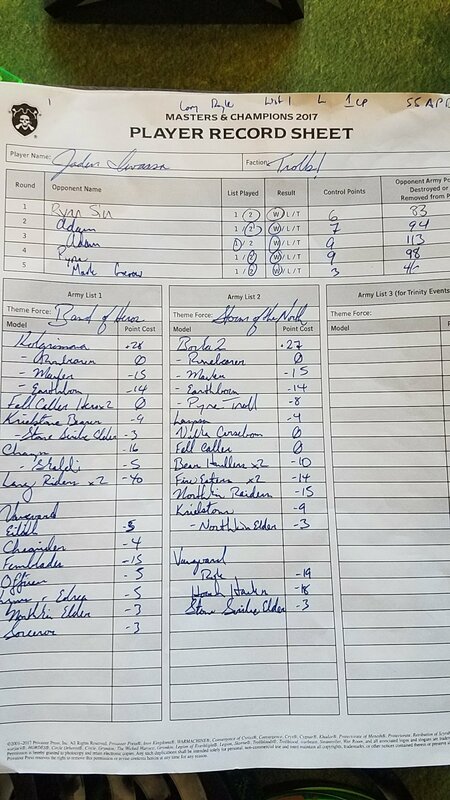 The Seattle Open was a fantastic event, well run and judged. I had a blast, I'll definitely be back, and I urge you to come give it a shot! Thanks for reading!